Manufacture and functionalise pelletised silica ? Incorporate pelletised silica into PSA, VSA and ESA systems ? Supply pelletised silica for membranes and filters ? Provide expertise in nanoscale hybridised materials ? The impact of human beings’ activities on this planet is being borne out in its atmosphere, with increasing levels of so-called greenhouse gases, of which CO2 is the primary culprit, being produced year upon year. It is now widely accepted that these emissions are contributing to the de-stabilisation of the planet’s natural carbon cycle and driving the climate change phenomenon. 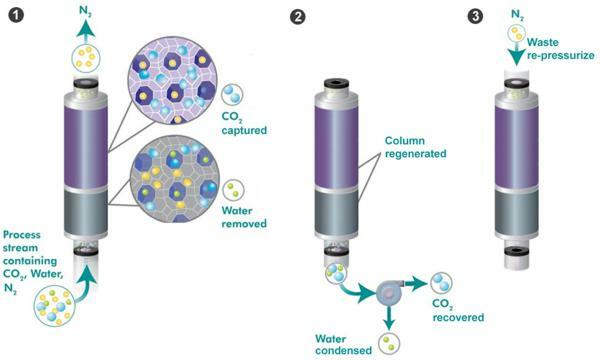 Methods of environmental amelioration include the capture and subsequent sequesterisation of CO2 gas at the point of source, i.e. in situations such as the combustion of fossil fuels. Extensive research and development in this regard has yielded the prototypic ‘green building’ and ‘green car’, but has also encountered limitations in relation to the efficiency of carbon-capturing materials. 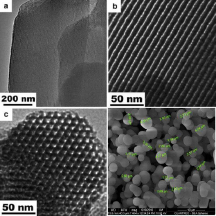 In the field of post-combustion capture, mesoporous silicas represent a highly efficient nanoscale adsorbent for CO2 as their larger pore size results in an increased carrying capacity. Incorporation of pelletized forms of these nanocomposites into Pressure Swing Adsorption (PSA) systems has the potential to vastly outcompete other capturing technologies, but until recently this innovation was limited by the failure to adequately pellet the capturing materials. By leveraging Glantreo’s material science capability, we have generated proprietary materials based on mesoporous silicas, such as SBA-15, which at a lab scale have been demonstrated to form pellets compatible with a PSA system. At this point we are keen to participate within a consortium whereby we can scale up our technology and be a key partner in providing a working solution to the problem of the level of CO2. 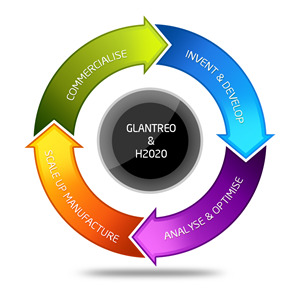 If you have that vision, then get in touch and talk to Glantreo about potential Horizon 2020 collaborations today. Click here to see what calls we are focused on for H2020.